The Bernissart Dinosaurs. | Letters from Gondwana. ← Poirot and the mysterious case of the Permian extinction. 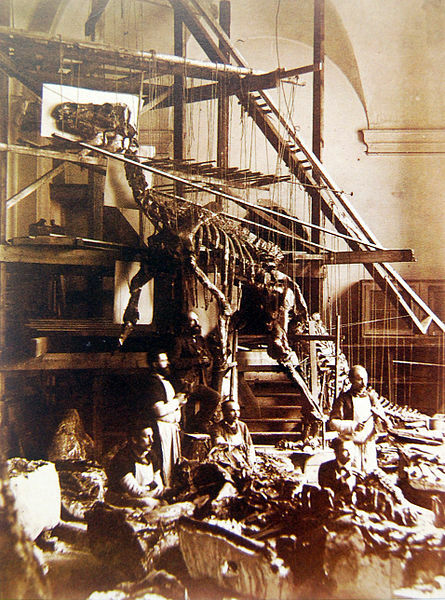 Mounting of the first complete Iguanodon specimen in the St. George’s Chapel. From Wikipedia Commons. In 1822, Mary Ann Mantell, wife of doctor Gideon Mantell, found large fossilized teeth near to a quarry in Whiteman’s Green,Cuckfield. Her husband, an amateur paleontologist, sent the teeth to Georges Cuvier. At first, Cuvier suggested that the remains were from a rhinoceros, but in a letter from 1824 admitted his mistake and determined that the remains were reptilian and quite possibly belonged to a giant herbivore. A year later, Mantell described them and named them Iguanodon (“iguana tooth”) because their resemblance with those of living iguanas. For the Crystal Palace exhibition in London, in 1854, the Iguanodon was reconstructed as large quadruped resembling a rhinoceros and for more than twenty years, that was the official image of the Iguanodon. But all that changed on February 28, 1878, when Jules Créteur and Alphonse Blanchard, two mine workers, accidentally discovered some fossil remains in a coal mine at Bernissart, Belgium. 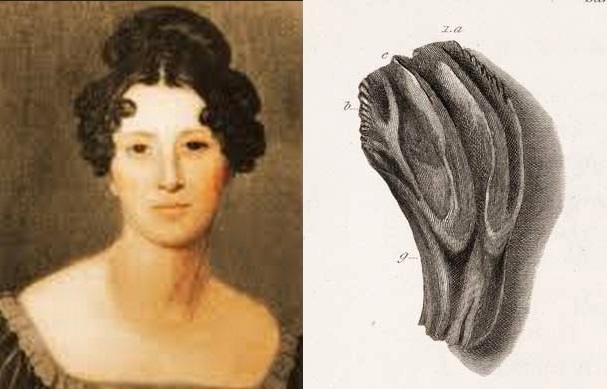 Mary Mantell and the lithographed of an Iguanodon teeth. Both miners were put in charge of the exploration of the gallery. They found more fragmentary bones and teeth. On April, the fossils were sent to geologist François-Léopold Cornet and Pierre-Joseph Van Beneden, professor of paleontology at Leuven University. Van Beneden identified the teeth as belonging to the dinosaur Iguanodon. The discovery was communicated to Edouard Dupont, director of the Musée royal d’Histoire naturelle de Belgique (MRHNB). Almost immediately, Louis De Pauw, head preparer at the MRHNB, went to Bernissart to explore the site. He reported that the walls of the exploration gallery were completely covered by fossil bones, plants, and fishes. To preserve the fossils, De Pauw created a very efficient excavation method: each skeleton was carefully exposed and its position in the mine recorded on plan diagrams. Every skeleton was divided into manageable blocks approximately 1 metre square, protected by a coat of plaster of Paris and then sketched and cataloged before being transported to Brussels. 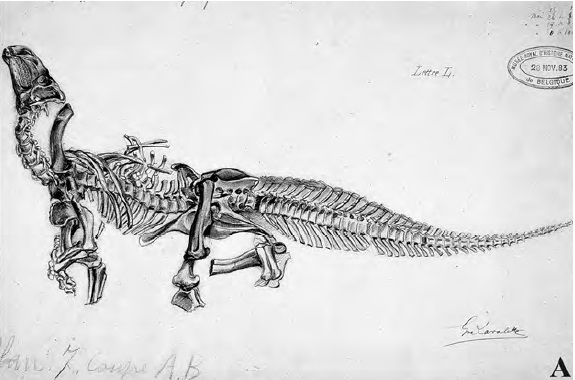 Drawing by G. Lavalette in 1883 of Iguanodon bernissartensis discovered in the Sainte-Barbe pit. In 1879, fourteen complete skeletons of iguanodontids were recovered, including two Bernissartia (a dwarf crocodile) skeletons, one “Goniopholis” (larger crocodile) skeleton, two turtles, and innumerable fishes and plant remains. Louis Dollo, who was an assistant naturalist at the Royal Belgian Institute of Natural Sciences in 1882, devoted himself to the study of the Iguanodons. Between 1882 and 1923, he published many preliminary notes on the Bernissart iguanodonts. He identified Iguanodon as an ecological equivalent of the giraffe with a kangaroo-like posture, using its tail and hind legs tripod-like. But in 1980, British paleontologist D. Norman published a monograph on Iguanodon bernissartensis and an analysis of the skeleton revealed that the vertebral column was surrounded by a network of ossified tendons distributed along the spine, which indicates that the more natural pose of the backbone was horizontal. Also, because of the structure of the pectoral girdle, the ratios of the forelimb and hind limb lengths, the strongly fused carpal bones, and the presence of hoof-like unguals on the middle three digits of the hand, Iguanodons possibly had a quadrupedal posture. After three years of excavations at Bernissart, the Belgian government were faced financial problems and the excavations were stopped. 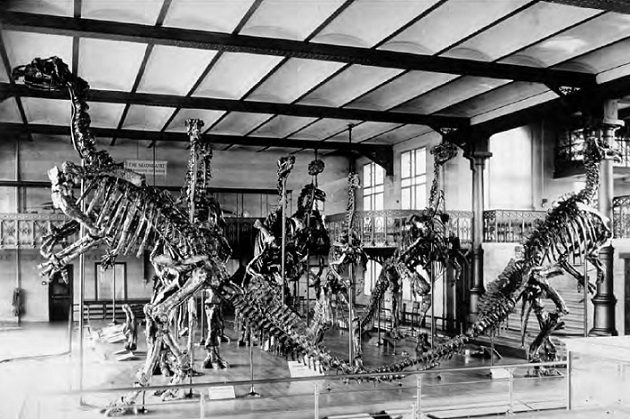 In 1883, the first mounted specimen was exhibited in the interior court of Nassau Palace and in 1891, the iguanodons were transported to the Royal Museum of Natural History in Leopold Park. During World War I, the German forces that occupied the city reopened the mine and the prominent Otto Jaekel was sent to supervise the excavations. After the war, further attempts to reopen the mine were hindered by financial problems and were finally stopped in 1921 when the mine was flooded. Sanz, José Luis, Cazadores de Dragones, Editorial Ariel (2007). This entry was tagged Bernissart, Earth Sciences, Gideon Mantell, History of Science, Mary Ann Mantell, paleontology. Bookmark the permalink. Pingback: Fossilized dinosaur brain tissue identified | Letters from Gondwana.